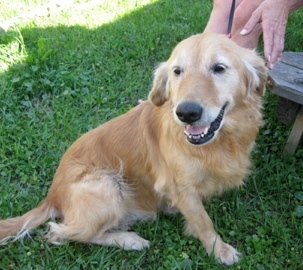 Ginger is a seven year old spayed female who was picked up as a stray with several other dogs. 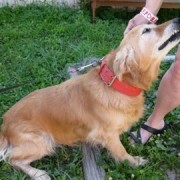 Appearance: Ginger is a red/gold golden with a soft coat. 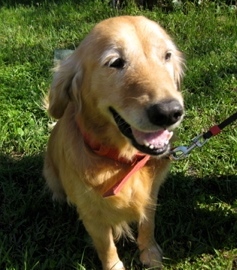 People and Kids: Ginger is a sweetheart and loves everyone. Animals: Ginger gets along with all dogs but we don’t know how she is with cats. 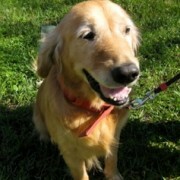 Skills: Ginger is house trained and knows a few basic commands. She rides well in the car and walks well on a leash. She also is a cuddle buddy. For a girl her age she is still very playful. Unlike younger dogs she is out of the chewing stage! 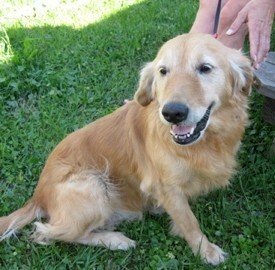 Health: Ginger is up to date on vaccines, spayed and micro-chipped. She is a healthy weight of 68 pounds. If you would like to be considered as a candidate to adopt Ginger fill out the online adoption application and mention her by name. If you are interested in adopting, please complete an on-line adoption application. For a specific dog (like the one on the left) please note the name and ID number and include it when completing the application.